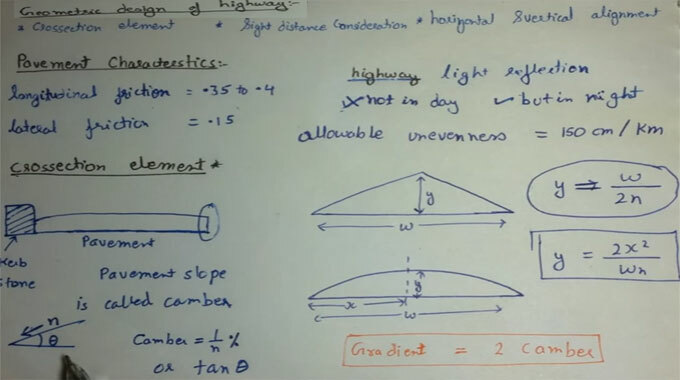 This construction video tutorial sheds light on geometric design of highway. The video will provide brief guidelines on how to design cross section element, sight distance consideration, horizontal & vertical alignment. The geometric design of roads refer to the division of highway engineering associated with the placement of the physical elements of the roadway in relation to the standards and constraints. The geometric design of highways plunges into the dimensions and layout of perceptible features of the highway. The objective of the geometric design is to focus on the requisite of the driver and the vehicle like safety, comfort, efficiency, etc. Usually, the factors like the cross section elements, sight distance consideration, horizontal curvature, gradients, and intersection are involved. The design of these factors significantly impacts the driver behavior and psychology, vehicle characteristics, traffic characteristics like speed and volume. Proper geometric design will lead to the lessening of accidents and their conformity. So, the main purpose of geometric design is to deliver greatest competence in traffic operation and optimal safety economically.